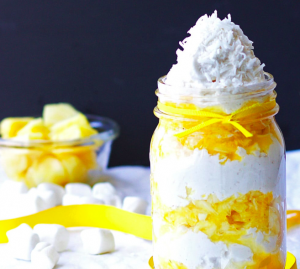 Make Your Own Delicious, Satisfying Pineapple Fluff! With Gluten-free & Vegan Options! Pineapple was an indulgence from the colonial period for decades, as consumers had to wait for the sweet fruit to arrive from ships coming from the Caribbean. As an expensive exotic fruit, the American elite and hospitality-friendly would rent pineapples for parties, adding them to tables for decor. Now accessible and affordable for households across the world, pineapple has become a healthy staple fruit that is found year-round from our farms in Costa Rica. Pineapple fluff became popular around the turn of the century, when canned goods became popular. We’d like to share a healthy and delicious twist on grandma’s famous fluff, with an easy recipe that will delight guests and family members. Available with gluten-free options or vegan, this is a treat everyone can indulge in. ¼ cup yogurt of choice greek, coconut, vanilla, etc. Use a food processor or blender to chop up the pineapple and oranges until they are small ⅛” chunks. In a small bowl, mix together the yogurt, whip topping, marshmallows, and coconut. Make your layers! Layer a few tablespoons of fruit, then whip mixture, alternating in a mason jar or other glass bowl. This make one large personal serving. Garnish with fresh pineapple and enjoy! This entry was posted in Recipes and tagged pineapple, pineapple fluff, pineapple recipes. Bookmark the permalink.